The new album from Mdou Moctar, Ilana (The Creator), out on Friday via Sahel Sounds, is a riveting release, full of some of the most inventive guitar-playing you're likely to hear in 2019. Mdou Moctar displays a jazz-y improvisational dexterity that is, in spots, breathtaking. 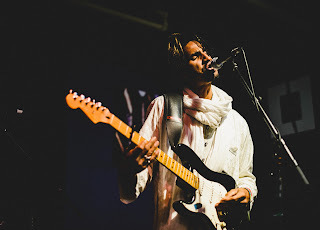 Opener "Kamane Tarhanin" sees Moctor drive the melody with an expert blend of nimble playing and fiery runs up the fret-board, while "Asshet Akal" finds Moctar steering this band into near blues-y territory, the hooks very nearly reminiscent of those of Led Zeppelin. Elsewhere, "Takamba" slowly revolves around a fiery solo, while "Wiwasharnine" has Mdou leading these players -- Ahmoudou Madassane (rhythm guitar), Aboubacar Mazawadje (drums), and Michael Coltun (bass) -- in a reel, with the Fripp-like guitar-runs anchoring this thing to earth in fine fashion. So much of the Niger-born musician's playing takes center-stage here on Ilana (The Creator) that a casual listener could be forgiven for not noticing right away how nicely his guitar-work blends with the equally-virtuosic playing of his band-mates. Ilana (The Creator) marries hard rock hooks to what we once called world music. I'd prefer to call this Saharan rock in 2019 as, clearly, Mdou Moctar's prodigious skills as a musician place him closely to mainstream rockers than his bio might lead a new listener to surmise. Ilana (The Creator) is out on Friday via Sahel Sounds. More details on Mdou Moctar via his official Facebook page.